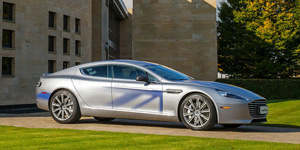 Aston’s RapidE endangered? In February 2016, Aston Martin and Chinese company LeEco closed a deal to develop the all-electric Aston Martin RapidE together. But now it seems the British brand has terminated this partnership, according to a media report. None of the firms have provided any official statements, however it is likely that the reason behind this decision are the apparent financial difficulties of LeEco, who did not yet pay its share of the Aston Martin project allegedly. If the planned launch of the RapidE in 2018 has to be rescheduled or not is open. NEVS and Iconiq: Saab successor National Electric Vehicle Sweden (NEVS) starts a joint venture with the Chinese start-up Iconiq Motors as both companies seek to develop and produce EVs. Ioniq’s first electrified mini-van Seven is to roll off the lines in Tianjin in 2019 once the local facility will be completed. Indian EV market: Indian Uber equivalent Ola reportedly plans to put up to 1m electric vehicles to hire on India’s roads. Ola founder ANI Technologies thus established a new electric mobility subsidiary. Ola Electric Mobility will enter the leasing market for electric cars first, with a business model for electric two-wheelers to follow and has started a pilot with EVs in its fleets already. SAIC subsidiary presents electric MPV: At the Commercial Vehicle Show in Birmingham, SAIC’s British brand LDV attracted attention with its all-electric seven-seater called EG10. The MPV provides 150 kW, a range of 100 miles (160 km) and can be fast-charged within 1.5 hrs. Three electrified models of GAC: The Chinese manufacturer has put three NEV on display at the Shanghai show. Besides its all-electric GE3, the line-up also includes the PHEV sedan GA3S and the PHEV SUV GS4. Further Details on propulsion systems or market plans have not been provided though. Another PHEV from China is made by Haval, that revealed its plug-in crossover coupé as a study at the Shanghai Auto Show. The model is called HB-03 and combines a 1.5-litre petrol engine with a 95kw electric motor. Its 13kWh battery shall allow a pure electric range of 65 km.